Herkimer is a county and a city in Upstate New York. It’s name comes from an heroic general who dies in battle during the American Revolution (see my post about Nicolas Herkimer here and the Battle of Oriskany here). 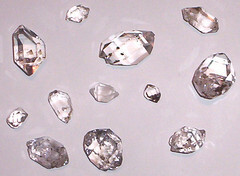 The Herkimer diamond is the common name given to a unique kind of quartz, found in the central-eastern section of Upstate New York, in the Mohawk Valley. 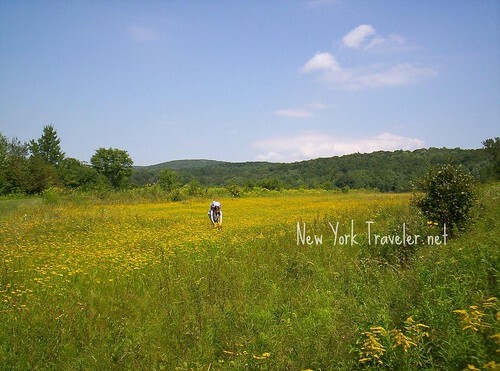 (The Mohawk Valley is nestled between our mighty Adirondack Mountain Range and the Catskill Mountain Region; see my post here for more about the Mohawk Valley). The Herkimer Diamond is not really a diamond; it’s the name for a double-terminated quartz, a very rare kind of quartz found in “vugs” or clusters. They have six sides (18 facets) and two terminations. Some of these stones are cloudy, some are clear, and some have impurities (like water or another quartz) inside. Herkimer Diamonds are considered semi-precious, and people come from all over the world to mine it. I always believed the Herkimer Diamond to be absolutely unique to a few counties here in Upstate NY, but I recently read that these kinds of quartz have been found in Arizona, China, and Afghanistan! There’s even a page at eBay devoted to information about the Herkimer Diamond. There are at least two “mines” in Upstate New York where you can pay a fee, enter a quarry, and chisel away in search of Herkimer Diamonds. Or, if your search proves fruitless, purchase some Herkimer diamonds at the gift shop. I have a small bag of Herkimer diamonds in my keepsake box. I asked a number of students of the Mohawks where the flint was in the Mohawk Valley that was so plentiful and so unique. No one could answer that simple question. The fact is, there is no rock face or quarry in the Mohawk Valley where flint is abundant or unique. As I discovered while researching Kuyahoora-Discovering West Canada Valley there are, however, a number of dolostone rock faces and quarries in the Mohawk Valley—from Middleville to the Noses—where a form of clear quartz crystal is abundant and unique. So unique that people from around the world come here to mine it. Then I read Mohawk Valley Archaeology: The Sites by Dean R. Snow and In Mohawk Country by Snow, Gehring and Starna. In both books it’s noted that the “the place of the flint” was more likely “the place of the crystal”, referring to quartz crystals that are now called Herkimer Diamonds. I contacted Charles Gehring and he referred me to Dean Snow. Dean is one of North America’s leading historical anthropologists and is currently Professor and Head of Anthropology at Pennsylvania State University. He was extremely helpful and suggested I read his book The Iroquois. Sometime the kids and I are going to go diamond-hunting. Hi! I found your blog through Carole’s Thoughtful Spot. I’ll be 30 in a week, but when I was 5, we moved from Durham, NC to Lake Placid, NY. Over the course of a few years, we lived in LP, Saranac Lake and Wurtsboro. My grandparents lived near Kingston. I miss it quite a bit. I now live near St Paul, MN and I blog and do photos of my (mis)adventures and the curiosities around here as well! You have an awesome blog. I’m looking forward to reading through it! I’ve never heard of these before. Thank you for the information. I’m interested in seeing one with water or another quartz inside it.